There’s a rousing editorial arguing passionately in favour of the UK remaining in the EU in this week’s critical referendum on the issue. ‘We need’, it argues, ‘to remember our history. Britain was formed and shaped by Europe. And we are – in historical as well as cultural, geographical and trading terms – a European nation. In almost every generation of European history until the past 70 years, people from these islands have fought and died in European wars. But within the borders of the European Union, there has been no war at all. This has not been an accident. To turn our back on that is unworthy of our traditions. Amen to that. Keeping fingers crossed tight for the actual vote. Which,all the indications are, is likely to prove very tight indeed. Economics, foreign policy and Britain’s idea of itself are all on the ballot. But after a divisive campaign so, too, is our ability to get along. Another powerful reason why the wise vote is for remain. Who do we think we are, and who do we want to be? Are we so different from others that we cannot play by shared rules? Are we one member in a family of nations, or a country that prefers to keep itself to itself and bolt the door? All of these questions were always on the ballot in this week’s fateful referendum. But after a campaign that has been nasty, brutish and seemingly endless, the UK will be voting on another question too. With all the differences and the diversity among all of us who already live on these islands, how are we all going to get along? In the run-up to polling day this contest has risked descending into a plebiscite on whether immigrants are a good or a bad thing. To see what is at stake, just consider the dark forces that could so easily become emboldened by a narrow insistence on putting the indigenous first. The backdrop has been the most unrelenting, unbalanced and sometimes xenophobic press assault in history. The leading political lights of leave have claimed to be pro-immigrant and yet have, at the same time, been ruthlessly fearmongering about Britain being overrun by Turks, after a Turkish accession which they understand perfectly well is not on the cards. The mood is frenzied, the air thick with indignation, and clouded with untruths. The best starting point for Britain to reach a sound decision on Thursday is to cool the passions of the heart, and listen to the head. All reason tells us that the great issues of our time have little respect for national borders. The leave side has attempted to turn “expert” into a term of abuse, but one does not need the IMF, the Bank of England or any special knowledge to grasp that these border-busting issues range from corporate power, migration and tax evasion to weapons proliferation, epidemics and climate change. Not one of them can be properly tackled at the level of the nation state. Impose controls on a multinational corporation and it will move to a softer jurisdiction. Crack down on tax evasion and the evaders will vanish offshore. Cap your own carbon emissions in isolation and some other country will burn with abandon. In so far as any of these problems can be effectively addressed, it is through cooperation. A better world means working across borders, not sheltering behind them. Cutting yourself off solves nothing. That, fundamentally, is why Britain should vote to remain in the club that represents the most advanced form of cross-border cooperation that the world has ever seen. We need, too, to remember our history. Britain was formed and shaped by Europe. And we are – in historical as well as cultural, geographical and trading terms – a European nation. In almost every generation of European history until the past 70 years, people from these islands have fought and died in European wars. But within the borders of the European Union, there has been no war at all. This has not been an accident. To turn our back on that is unworthy of our traditions. This is not to dispute that there are flaws in the way that Europe is constituted and led. The EU is a union of nations working together, it is not and never will be a United States of Europe, and so its leadership is bound to depend on the imperfect leadership of all these countries. The single currency has been a flawed project and has set one nation against another, forcing the poor to pay the price for propping up a shonky structure. But Britain is not part of the eurozone, and the EU is not a plot against the nation state. Britain is still robustly herself too, warts and all. If the EU has become a whipping boy, that is in large part because of the frustration that many inevitably have with day-to-day life in Britain. There are millions of citizens whose wages have been stuck for many years, whose job security has been hollowed out, and whose hopes of a fair deal are being undermined, all at a time when immigration has increased. People are bruised and angry, and many are ready to take it out on those they feel have let them down. Even if the UK government itself actually bears far more of the responsibility, it must be admitted that the EU is part of an international economic order that has been unkind to many. The wish to kick against it can thus be understood, even though it is mistaken. For the core issues here are labour standards, and they are more effectively governed collaboratively, or else the great danger is of a competitive pressure to strip away protections covering hours, discrimination or agency and temporary working. More broadly, there is no crisis in Europe which is so serious that it would be better for the British prime minister to be outside the EU knocking on the door pleading to be heard rather than inside the room sorting things out. A leave victory would not solve the problems that cause such anger. On the contrary, it would make most of them worse. The only argument about the immediate economic effects of Brexit is the depth of the hit that the economy would take, not whether it would take a hit at all. The political victors would not be those who wish to rebuild politics. They would be rightwing Tories, and ruthless plutocrats who want freedom to reorder Britain and make money as they choose. They have no interest in fairer taxes on the rich, or higher spending on the NHS. They have spent their so-called Brexit dividend – which in reality is almost certainly a negative number, not the mendacious £350m a week which has earned them an official reprimand – many times over. A significant group of them are flat-taxers who are whispering about deep cuts to corporation taxes. Facile Brexiter talk of a more buccaneering Britain – presumably a country fit for Sir Philip Green or Fred Goodwin to capture other galleons – offers precisely nothing to assuage the fears of elderly voters who simply want nothing more to change. It is a fantasy to suppose that, if Britain votes to leave, these victors would want to maintain or extend protections for pensioners or workers. On the contrary. Human rights, equality, health and safety, and aid to refugees would be out of the window. Those who vote to leave as a protest against the elite will, in truth, be handing the keys to the very worst of that very elite. There would be no “taking back control” for most working-class leave voters, just less control over their diminishing share than ever. Those who have not yet made up their mind in this campaign should ask themselves this: do you want to live in a Britain in the image of Nigel Farage? Yes or no? For that’s the choice on offer. 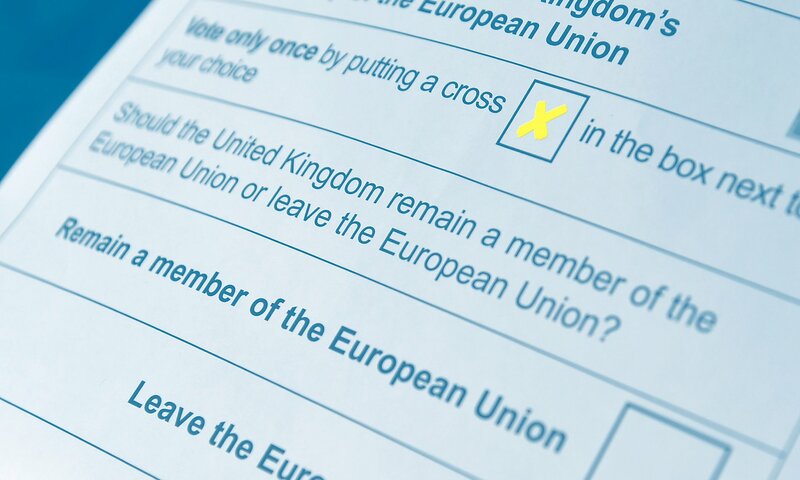 If the answer is no, then vote remain. Thursday’s vote is in some ways a choice between an imaginary past of which too many in this country cannot let go and a future about which all of us are inescapably uncertain. If it goes in favour of leave it will hand Britain’s young people a country that most of them do not intend to vote for. Is that fair? It may push Scottish nationalists to proceed with a break-up of Britain that was rejected less than two years ago. Is that responsible? It will put the settlement in Northern Ireland – the fragile prize won so recently from decades of hatred – at risk. Is that worth it? Not at all. Instead we should be putting our shoulders to the task of building a democratic, devolved, multicultural Britain with a fair deal for all, connected to the world and working with our European neighbours. The campaign has further alienated voters who were already disaffected. To an extraordinary degree, it has inflicted the Tory party’s pathological obsession with the EU on a country that does not ordinarily share it. No one bears more responsibility for this whole unedifying event than David Cameron, it is true. In the end, though, Thursday’s vote is not about him. It has become a turn-in-the-road issue for Britain and Europe alike. Imagine a world without the EU – without the clout to face down Russia over Ukraine, without the ability to put together coherent answers to carbon emissions, to protect standards at work from a race to the bottom. Like democracy, the EU is an imperfect way of answering the modern world’s unrelenting challenges. But the answer to its imperfections is to reform them, not to walk away – still less to give in to this country’s occasional hooligan instinct in Europe. Like democracy, whose virtues are in our minds afresh after the violent death of the committed and principled MP Jo Cox, the EU is not just the least bad of the available options. It is also the one that embodies the best of us as a free people in a peaceful Europe. Vote this week. Vote for a united country that reaches out to the world, and vote against a divided nation that turns inwards. Vote to remain.